Sen. Jim Webb will meet with leaders of Myanmar’s military junta this week when he stops off in the reclusive country during a two-week, five-nation tour of Asia, his office announced Wednesday. The Virginia Democrat will be the first member of Congress to visit Myanmar in more than a decade. The visit will also be the first time a top U.S. official meets with Myanmar’s top official, junta leader Senior Gen. Than Shwe. 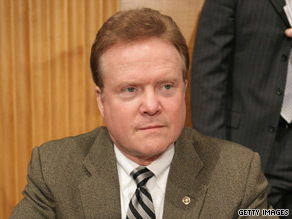 Webb is chairman of the East Asia and Pacific Affairs Subcommittee of the Senate Foreign Relations Committee. The first-term senator’s visit follows the conviction earlier this week of Nobel laureate Aung San Suu Kyi for violating her house arrest when an uninvited American swam two miles to her home in May. Suu Kyi, who has spent 14 of the last 20 years in one form of confinement or another, was originally sentenced to three years in prison, but Than Shwe commuted her sentence to 18 months house arrest. Her uninvited visitor, John Yettaw, was sentenced to seven years hard labor. Lawyers for both said they would appeal their sentences, and the United States slammed the prosecution of Suu Kyi, who won the Nobel Peace Prize in 1991.